Kinabatangan River is the second longest river in Malaysia and famous for the diverse wild life living on its shores. Its 560 km stretches across Sabah on the fascinating island of Borneo. Visitors come to this river for wildlife cruises and guided treks usually organized as a packaged tour that includes transport, food, and lodging. Many of these packages can be overwhelmingly pricey, especially for a backpackers budget. Jonny and I have always disliked ‘guided tours’, especially packages, and try to avoid them if we can. So, we managed to find a phone number for a little homestay near Sukau, called the owner up, and organized accommodations and food through her on our own. She tried to have us agree to a package of 3 river cruises and a trek, but we asked her nicely if we might just do 2 cruises and add on more activities as we went. She agreed, and it was as simple as that!  It would cost 40 RM ($12 CAD) per person for one night of lodging plus dinner and breakfast. A night cruise would cost us 100 RM ($30 CAD) for two people and a morning cruise would cost 150 RM ($45 CAD). The cheapest package we could find was through our lovely hostel in Sandakan called Sandakan Backpackers (which is a great little place to stay with an excellent sea view from their roof top terrace). 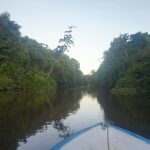 It was a 2 day and 1 night package that included 3 cruises, 1 jungle trek, accommodations, food, and transport for 285 RM (about $85 CAD) a person. The price was actually quite appealing, but we only had an interest in doing 2 cruises and felt as though 3 was too much. 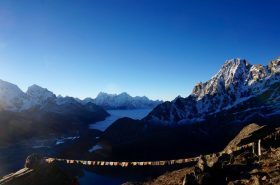 Plus we were done with trekking as it hadn’t been long since we had just completed 18 days of trekking in Nepal. 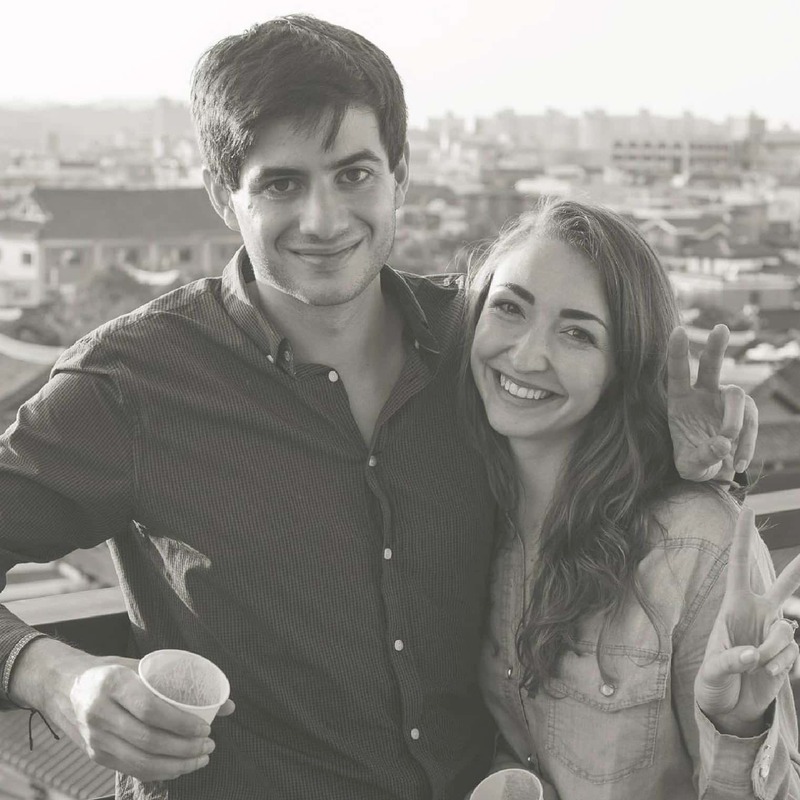 We decided to organize our own trip and stay with Maria at her homestay rather than get stuck in a package. She would provide accommodations, food, and the cruises; the only thing left was to figure out how to get there. First, we had planned to brave taking the local bus considering it would be cheaper and more adventurous. In the end, it sound like a bit of a hassle where we would only be saving a small portion of money. Not worth it when you are heading for the jungle! In the end, we organized transport through a hotel. The vehicle was a nice, air-conditioned van that would take us directly to our homestay for 50 RM each. We arrived in Sukau the following morning after about a 2 hour drive from Sandakan. 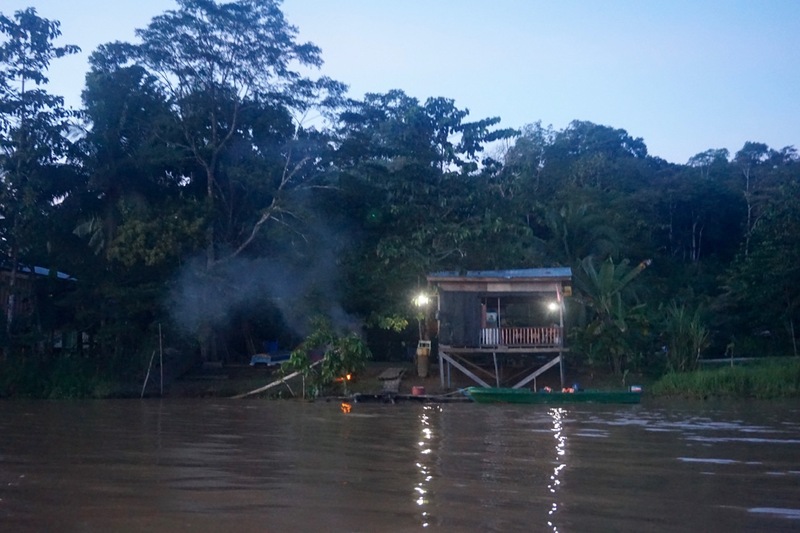 Our homestay was situated right on Kinabatangan River providing an amazing view of the chocolatey brown water and lush green forests. Maria gave us a warm greeting, offered us a tasty homemade lunch, and within an hour we were off on our first river cruise. We veered off onto a smaller branch of the river where the trees and plants felt closer to us on either side. 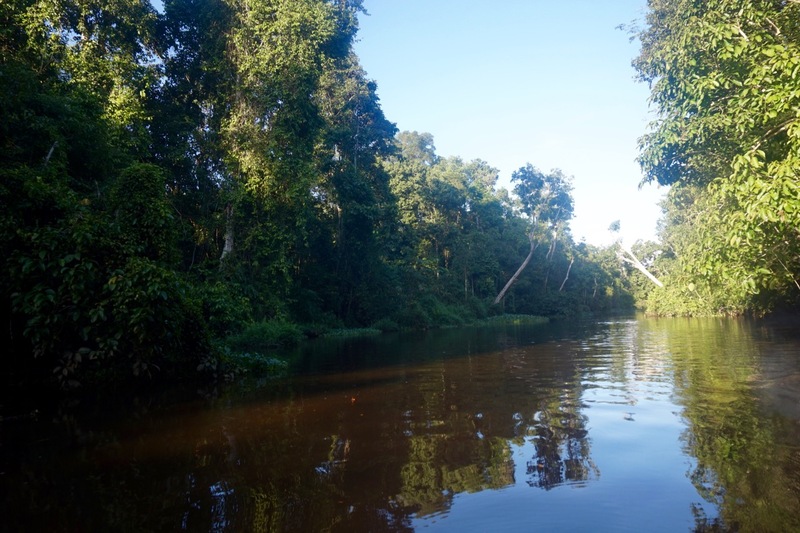 Just listening to the jungle and slowly moving along the river on a little boat, felt so relaxing and calm. 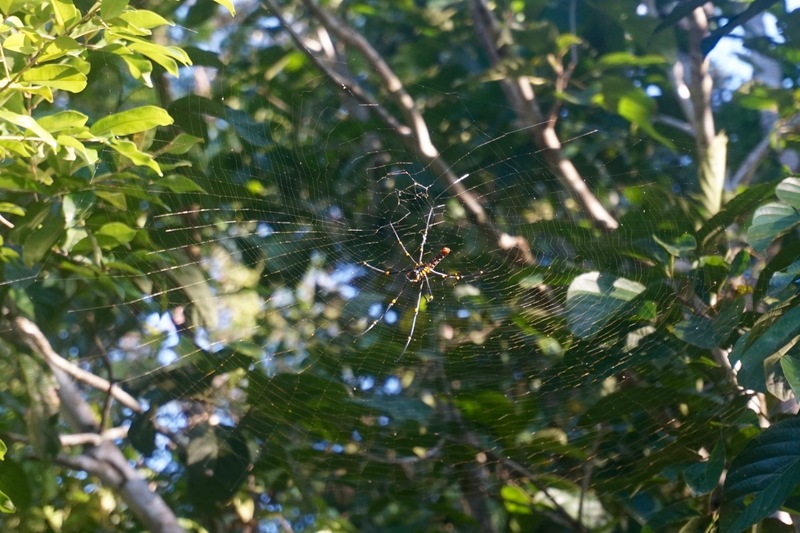 Our guide had eagle eyes and was able to spot our first find; a large spider whom built its web right next to the river. 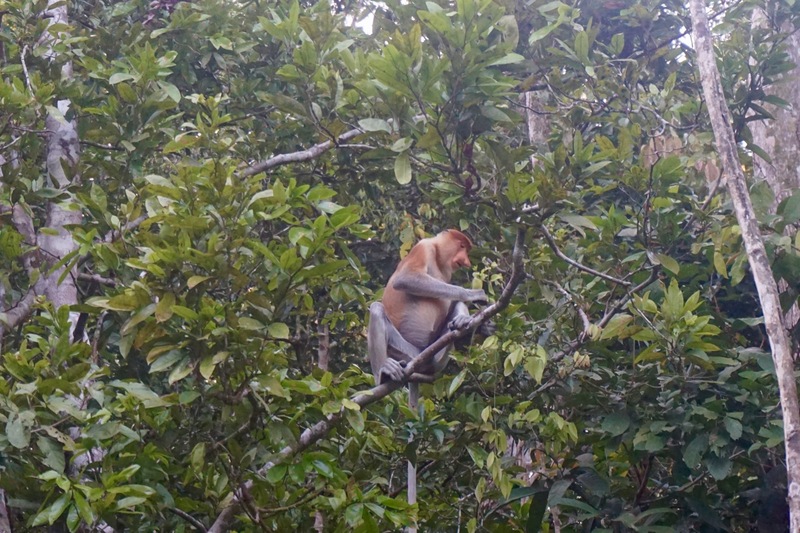 I was so eager to see a Proboscis monkey on this trip. When I finally did, I couldn’t believe how strange they looked in the flesh. You often see paintings and art work around Borneo depicting these odd creatures by exentuating their distinguishing noses and swollen pot-bellies. Of course, you really understand why if you ever get a chance to view one out in their natural habitat. They all have large, gonzo shaped noses and look ready to give birth to a baby! They were so fascinating to watch as they munched on tree leaves, picked at one another’s fur, and awkwardly leaped from higher branches to lower ones. 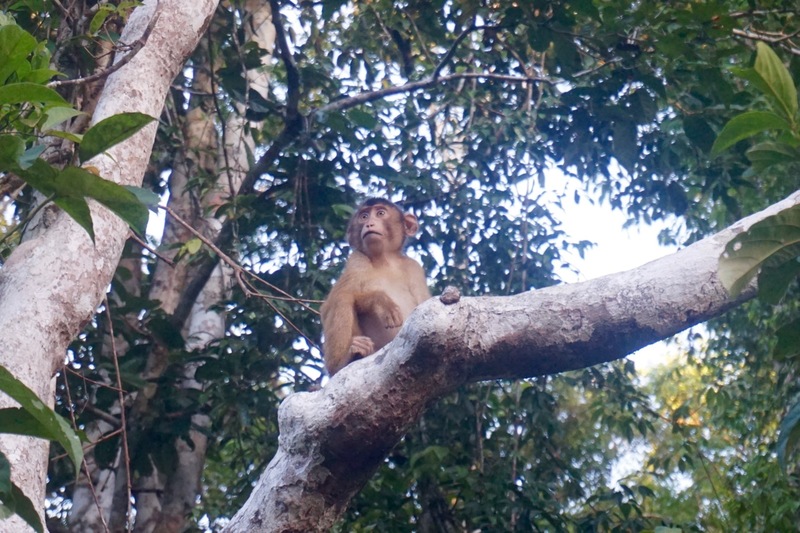 We also came across tons of macaques and these smaller, cuter monkeys with big eyes, adorable sounds, and tiny bodies. Another animal which is exciting to see are the various kinds of Hornbills. We saw many throughout our cruise, but taking a good picture of one proved to be difficult. 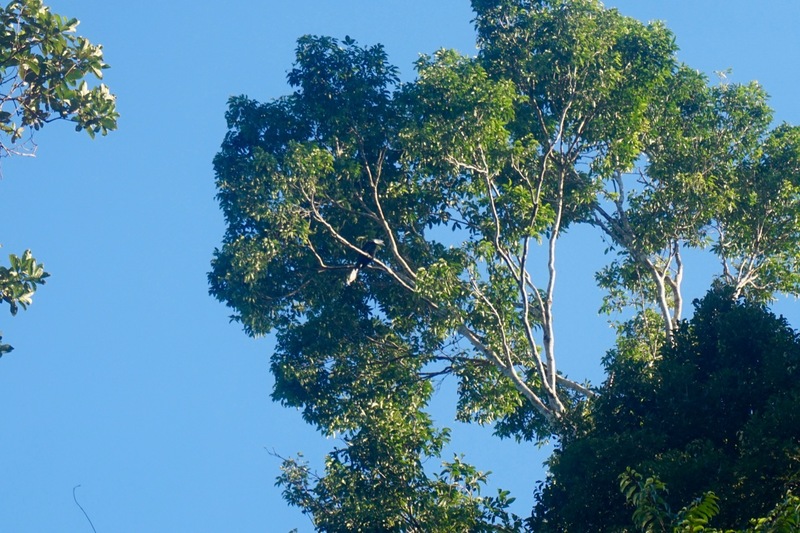 They are easy to spot because for a bird, they are quite large and each have a horn-like bill. The last animal we saw was completely unexpected. 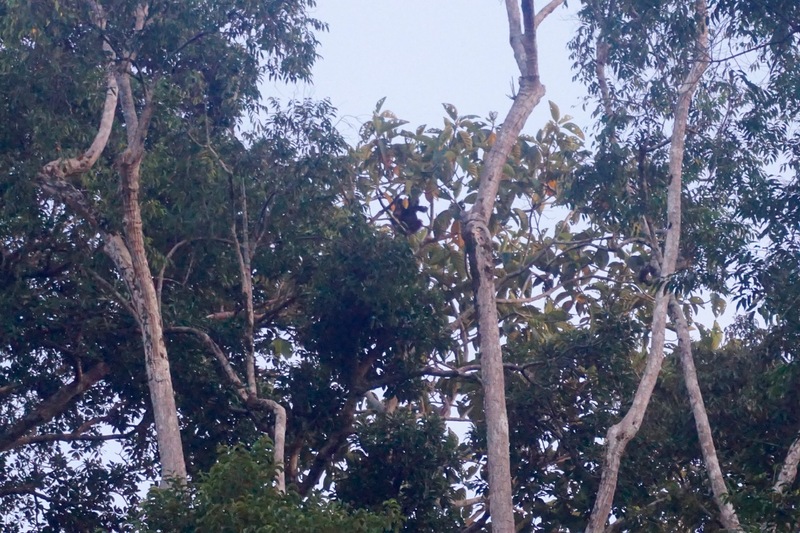 Orangutans are quite shy and like to avoid areas with too many people, but this one seemed to be comfortable enough at a distance and our guide with his keen eye spotted it hanging in the trees. After a successful first cruise, we headed back for some rest and relaxation. We still had the night cruise to follow, but spent our time waiting by reading, visiting, or simply enjoying the surrounding nature. When the time finally came, we decided to leave our camera behind for the night cruise. Our camera took lousy night photographs, and using flash would disturb the wildlife. Instead, we chose to simply enjoy what the evening had to offer us free of electronics. It took a good 25 minutes or so of searching before we came across anything. We spotted two beautiful red birds huddling under a few leaves. The color of their feathers was so vibrant against the dull, gray jungle backdrop. I think I fell in love with birds after seeing that amazing pair. The remainder of our cruise turned out to be quite different from a normal one. 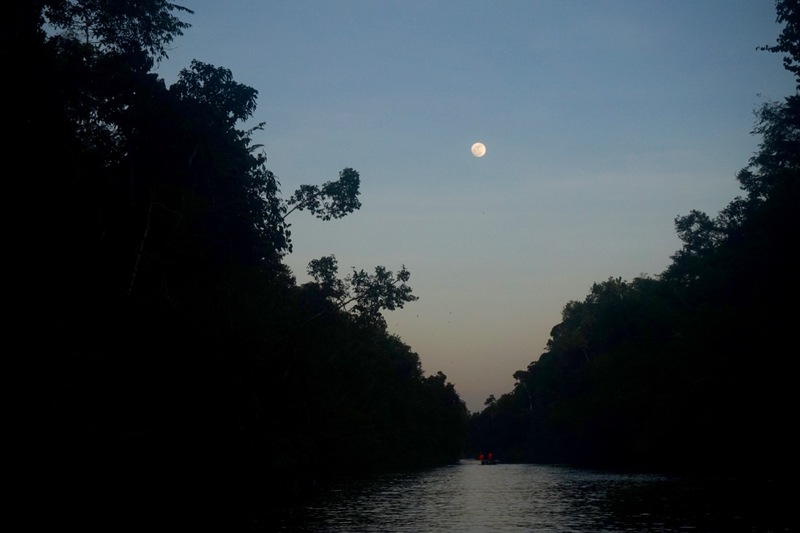 Usually, we would have continued down a smaller branch of the river, as we did on our earlier cruise, and search for more nocturnal animals. But, we had received word that a herd of pygmy elephants were not far from the river and we had a chance of seeing them graze there. We found the place where the elephants were, turned off the boat engine, and listened. Large ‘swooshing’ and ‘crunching’ noises came from the tall grasses on the bank of the river, we had found wild elephants! Our guide was careful to use his flashlight once in a while as he searched through the grasses; sometimes we would get a glimpse of a head, a trunk, or an ear. My heart wouldn’t stop beating from the excitement. We decided to head to the shore for a better view. Our guide parked the boat on his friend’s property, and we all quietly stepped off one by one. We moved towards the grasses where the herd was and saw several elephants slightly hidden behind the plants and eating away. We had to be very careful not to disturb or frighten them. It was a little stressful knowing that now we were on shore, and close enough for an elephant to take a charge at us at anytime. Thankfully, we did not stay long. Our guide told us that they were likely to move again and he suspected in our direction. That was cue enough for all of us to get back to the boat. The night cruise was such an amazing experience. We were very lucky to have had the privilege of seeing wild pygmy elephants and in such close proximity! 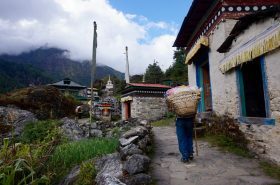 We returned to our homestay, ready for a cup of tea, and a good nights rest. The following morning, we headed back to Sandakan. For us, 2 cruises was enough to get our fill of the jungle river cruise experience. 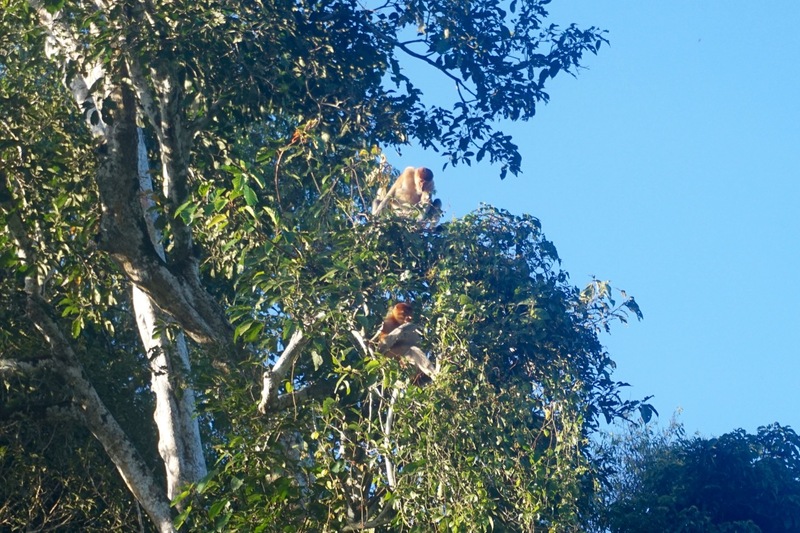 For others, they might enjoy more time at Kinabatangan before they are ready to leave. 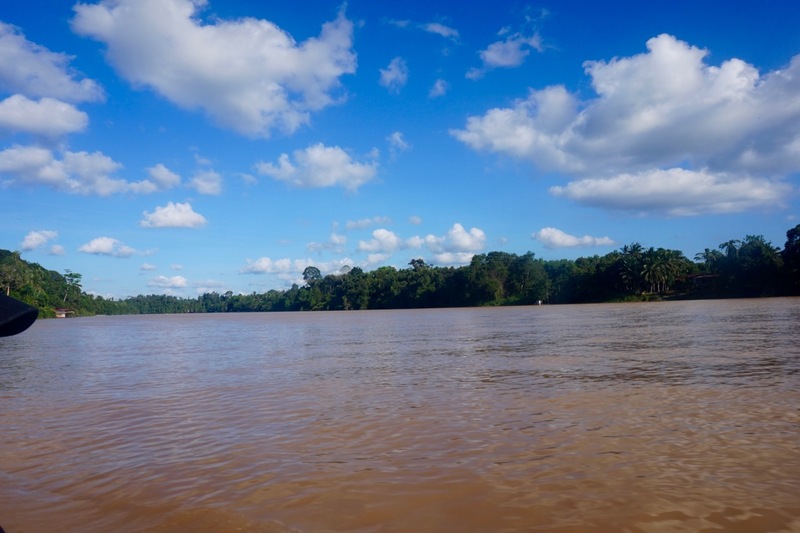 If you are in Sabah, we highly recommend that you try to visit Kinabatangan River. There is no guarantee that you will see anything, but there is a very high chance that you will! 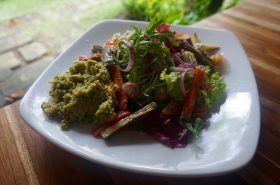 Aim to stay at a locals house, that way you are supporting them directly and likely their business practices are more ethical and eco friendly than any resort you will find. Plus, you get to see how people have learned to survive in the jungle. Our host, Maria, was full of interesting knowledge about the plants, trees, the river and its surrounding wildlife. At moments, her eyes would well up in tears because she loves her home and the land that it’s on; yet the threat of new palm plantations moving closer to the river is endangering its wildlife and changing her and the other villagers way of life. We stayed with Maria at Sukau River Homestay and would highly recommend her as a host! Just a forewarning for those who are a little more ‘high maintenance’, there will be bugs in your room, roosters cockadoodle dooing at all of the worst times, and chickens roaming free at this homestay and many others like it. Bring bug spray, a good pair of boots, and a positive attitude. Please show respect for the people who welcome you into their home. They are likely giving you the best rooms that they have, so don’t complain unless it is a serious matter! Our host family all slept together on the floor in their kitchen, so when we noticed a few small ants crawling on our bed sheets, we did not say a thing. Our river cruises both ended up being 100 RM each for the two of us. Maria drove us some of the way back to Sandakan, then she helped us hire a driver for only 50 RM. If you have questions about visiting Kinabatangan River, Sandakan, or anywhere else in Sabah, do not hesitate to ask! As always, we write these posts to share our experiences with like-minded travellers, so we would love to hear from you and learn about your own experiences.